The Hunger Games teaser trailer just debuted at the MTV Video Music Awards, which I stopped watching 'oh about 16 years ago.' The teaser trailer is on youtube though so check it out. As far as teaser trailers go, it's not all that interesting. I still think that Jennifer Lawrence has been miscast for the role. I'm willing to be proved wrong and I've been wrong before. I didn't think Daniel Craig would be a good Bond and boy did I eat my words. I'm primarily concerned that they are trying to 'Twilight'-up The Hunger Games (Gale v's Peeta). If you haven't read The Hunger Games yet and want to know more about it, check out my post from last week. It can be viewed here. I continue with my theory that both Peeta and Gale have also been miscast (at least physically). 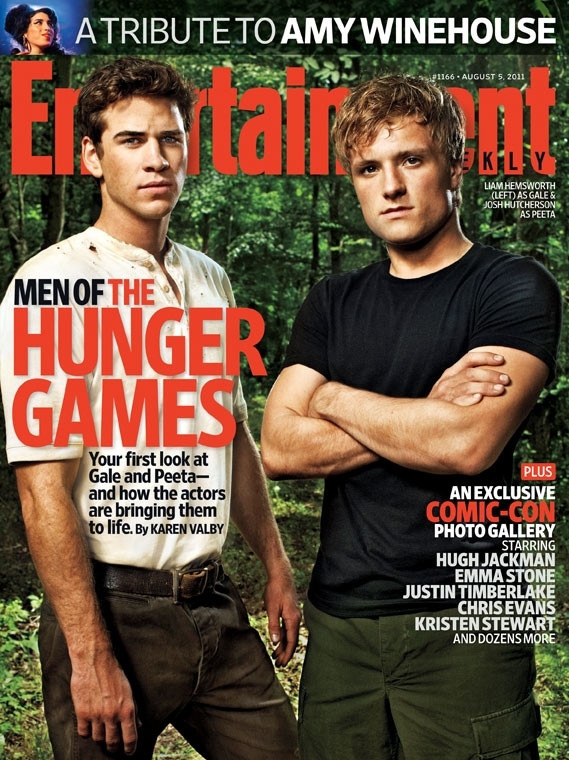 However, I am amazed how they've managed to make Josh Hutcherson appear to be the same height as his co-star, Liam Hemsworth. Josh is 5'-7" and Liam is 6'-3". There shouldn't be this vast of a height differential. But considering the magic of hollywood, computer generated effects, and Tom Cruise-style shoe lifts, I'm sure it will be fine. After all, look at this picture. They've made 8-inches of height completely negligible. 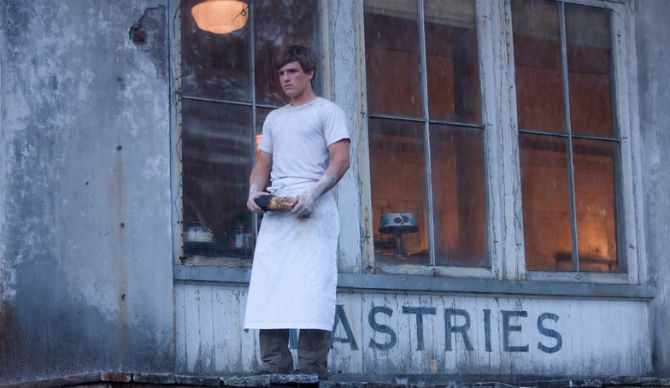 Maybe they had a stool for Hutcherson? I read the first Hunger Games, and even though I enjoyed it enough, I just kept thinking "Battle Royale", but the more kiddy-safe version of it. I kind of don't get what the big deal about the books are, though. I'm going to have to agree about the miscasting for sure. But hey, we might be proved wrong, just as Ledger did for the Joker way back when. The guy on the right looks like a buff Dexter. I loved the books. Hope I like the movies. I can't find your follow button. I'm going to try again! @Alex-- Ha, they had something for him. I'm thinking photoshop. @Cherokee-- I really need to read Battle Royale. You're the 3rd person who's mentioned it. From what I've heard about the Hunger games trilogy, the 3rd book is much darker. I just finished the 2nd book and I can tell you that the 2nd book was a lot more grown up than the 1st. @Libby-- Thanks! It should be at the top. If not check my friends section. Eh, not really interested in this series though I've heard quite a bit about them. The video's down, but I get what you're saying. Only time will tell on this one I guess, we'll have to see how it goes when the movie actually comes out. Yeah Viacom took the original down. Here's a new one. Come on Viacom-- the genie's out of the bottle. I'm afraid you're going to be disappointed with the whole Twilight triangle comparison. Collins herself creates the same situation in the Hunger Games books. I'm sure the movies will do the same. The following is just a theory. I have nothing to base it on other than my own thoughts: I think that someone in the development process wanted to make Katniss stronger or more badass. Having her be tiny and especially having Peeta help her too much, including saving her at least once, would not fit into this model. Making her physically the same size as Peeta is a way to accomplish this new model, hence the casting. Most of the trailer reminded me of some of the cheesy book trailers I've seen on YouTube, but it improved as it went on. It still didn't do its job though. It didn't make me want to see the movie. Wish Hollywood could do something about my height. I'm turning into the incredibly shrinking woman. haha ummm im not sure aobut this one! I actually haven't read the books since I've got a pile of books I want to read before I start another young adult book series. I thought that the lead girl in this is supposed to be like 13 or 14. @Chip-- Thanks for the tip. You're now the 4th person to mention Battle Royale. I will be getting this book asap. With regard to Hunger Games, I think you're right. I can see how Collins tried to emulate the Twilight love triangle, which is unfortunate. @Mark-- I agree. I really hope they don't mess this one up. @Film Geek-- The lead girl is 16-17, which is a little older than most young adult fiction. The book is actually written very well considering it's young adult fiction. At times there was slightly yucky feeling of "teen moments," but overall the book was very adult in nature. I simply couldn't put it down. I also agree about the Katniss/Peeta thing.